I wonder if the manufactures of those large wooden swing/play structures take account of how many divorces they are responsible for. Only after the three-box, 400-pound monstrosity has found its way from the store to our house do we discover that it has more pieces than any Swede with a master’s in architecture has ever seen. And don’t get me started on the instructions. I guarantee they would be more helpful if they were actually written in another language. But they are not and how my husband and I have not killed each other yet is both a mystery and a miracle. We worked one a bit a week, for about 3 weeks. And finally the 29-step assembly of this play centre is complete and the kids are in love with it. I think the thing I’m most surprised at is that it didn’t take over our whole backyard. I expected it to be bigger than it was, even though we measured where it would go. We don’t have a huge backyard, but it’s not puny either. 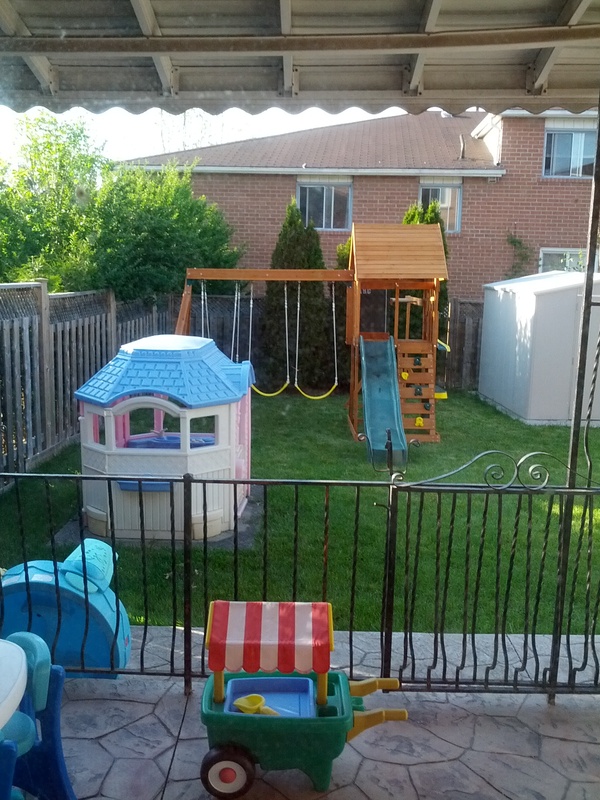 I was happy with how it turned out and how it fits nicely at the back of the yard. And they are happy too. They have been outside every minute since its completion; climbing, sliding, hanging on the monkey bars. I think that they will be spending a lot of time out there this summer, which is the hope. It’s not that I don’t like the park, but I hate the sand that goes along with that visit. We pour sandcastles out of everyone’s shoes when we come home from the park. So I’d rather them just go outside, where they can come in and out of the house, enjoy snacks and a drink – sand free! I think for now, D and I will accept our award for parents of the year. IKEA furniture. We’re about to embark on a big boy bed for my two year old. And we I say we’re I mean my husband. I can’t imagine trying to put together one of those monstrous swing sets, although I’m extremely jealous of it. Hmmm….maybe I’ll look for one online that’s already put together! Ya. It definitely requires more patience than skill, that’s for sure!